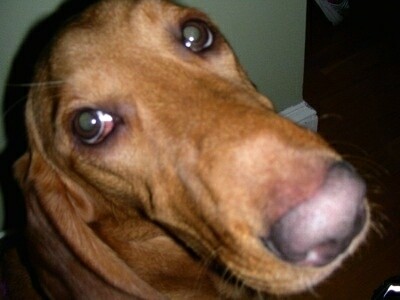 "Ani is the first dog I ever owned. I rescued her from my local shelter when she was almost 1. The shelter had Ani as the "featured dog" meaning her days were becoming limited. It may have been the thought of another dog not getting a fair chance in this world (which is just cruel), or her "unique" look that attracted me to her (which is how we describe her to people). She is now 3 and has grown to be one "long dog." She truly does have the characteristics of a Basset Hound (loves to sleep, short legs and long ears) and Golden Retriever (plays with best of them). 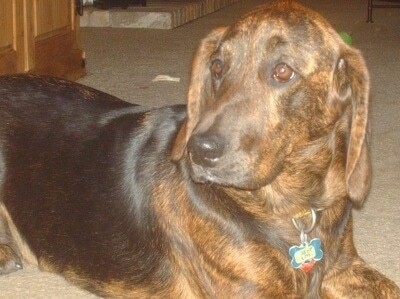 We got Ani a brother a year ago, Jaxson, a Basset Pointer mix, whom she has grown to love. 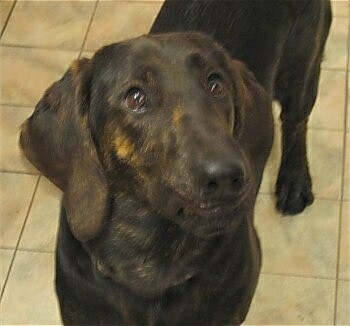 I could not ask for a better tempered dog; she plays very well and is very obedient. She loves to go for a walk and/or play in the backyard, but she has grown up in an apartment and has done very well with the smaller space. I watch the Dog Whisperer whenever I catch it on TV. Cesar's philosophies really work. My wife and I really try to be very patient before walks and activities so that Ani calms down and relates calmness with reward. We have also been working on having Ani walk behind us, such as Cesar does with his walking stick." 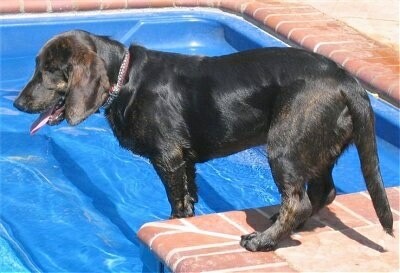 The Basset Retriever is not a purebred dog. 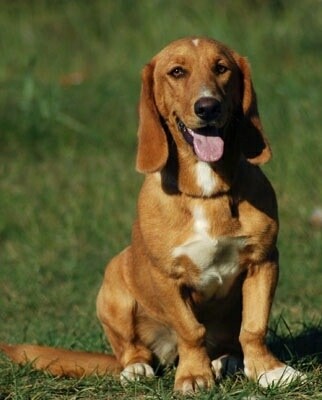 It is a cross between the Golden Retriever and the Basset Hound. The best way to determine the temperament of a mixed breed is to look up all breeds in the cross and know you can get any combination of any of the characteristics found in either breed. Not all of these designer hybrid dogs being bred are 50% purebred to 50% purebred. It is very common for breeders to breed multi-generation crosses. 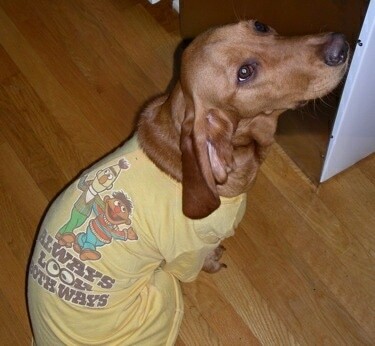 "This is my 7-year-old Basset Retriever named Huppie. 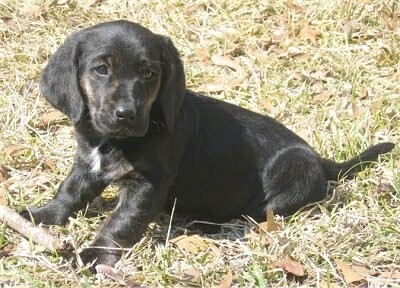 Her mom is a purebred Basset Hound and her dad is a purebred Golden Retriever. 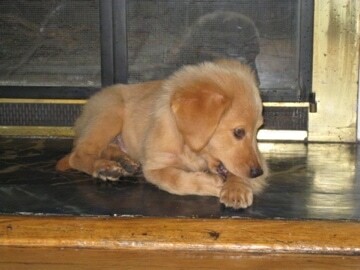 When we got her she was just a small pup and we didn’t expect her to be so big as she grew older. She likes taking walks and being loved by our family (human and dogs alike). She is one of 6 dogs we own and is the oldest of them all." 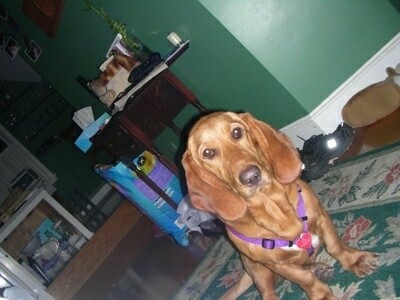 "This is Gracie, our 1-year-old Basset Retriever. My husband and I adopted her when she was 5 weeks old and were told that she was a Basset Beagle. I had her DNA tested through Wisdom Panel and just found out that she is a Basset Retriever! She is very playful. She is very intelligent and relatively easy to train, if you can get her attention. The only problem that we have had with her is she would limp occasionally when she was younger. This was mainly due to her growth plates which have corrected themselves naturally and we watch her diet because the extra weight causes the problems to flare up again. She is an amazing family dog and loves children and anyone else that will give her a belly rub. We are just thrilled that we know what she is and that there are more just like her!" "This is Lilipop, my Golden Retriever x Basset Hound puppy at 3 months old." Zoey the Basset Retriever (Basset Hound / Golden Retriever hybrid dog) at 8 months old—"Her mother was a Golden Retriever and the father was a Basset Hound." "I got Phoebe 6 years ago when she was 13. 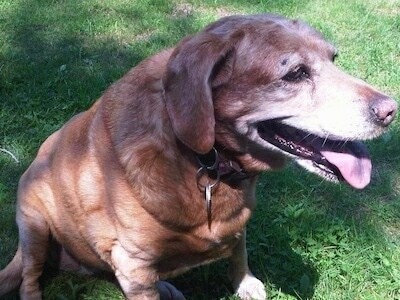 She was such a well behaved, loyal dog. I sadly had to have her euthanized at the age of 19 due to canine Lyme disease taking its toll on her. She is very much missed." 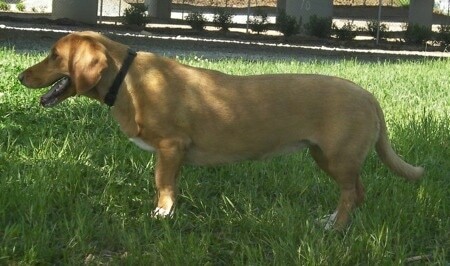 "Maggie is a Basset / Golden mix. She was not purchased as a designer breed. She was rescued." 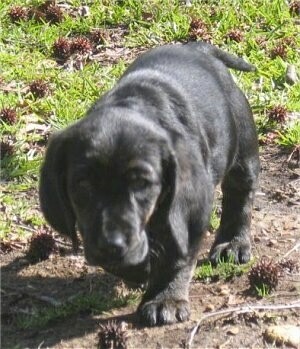 "This is Wally, a Basset / Golden puppy at 9 weeks old. Mom was a Basset and dad was a Golden. He is extremely friendly, smart and social with everyone he meets (humans, dogs, cats and even horses!) Wally was named after Wally the Green Monster, the mascot for the Boston Red Sox. 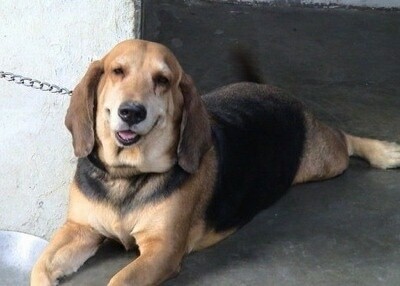 Very simply, he looks like a Basset with golden fur!" 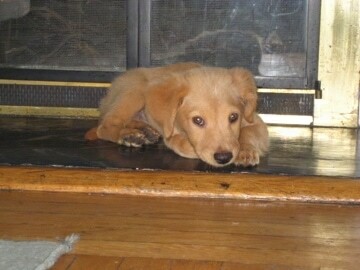 "This is Buckley, shown here at 4 months old. 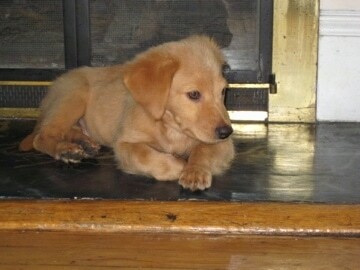 He is a Golden Retriever / Basset mix. He is very friendly (with both people and dogs) and loves to play. He was docile at first, but is getting more active every day! He chews the furniture, which we are trying to stop, but he is doing very well with his house training. He doesn't like to be alone, but entertains himself when he is." 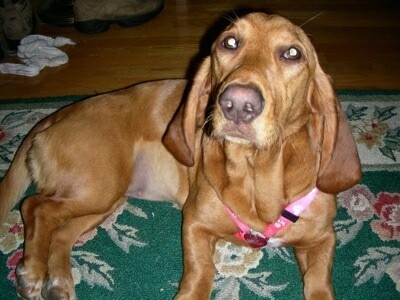 "Rosie is a 9–month-old Basset Retriever pup. We found her on craigslist after looking at all the other adoption sites in the area. She was 6 months old and housebroken, but we never had the chance to see her as a little pup. At that time she was just a little larger than mom, and she now weighs in at about 44 lbs. We live in a small apartment, and were looking for a dog who would want to go for a run down the beach, or a long walk around the bog, but we didn’t want a big dog to take over the whole apartment. Luckily we found Rosie! She has the playfulness of her dad (the Golden) and loves to fetch a tennis ball all day, and at times the activity level of her mom (the Basset), just wanting to sleep in the sun all afternoon. She loves her play time, and if you aren’t paying attention she will crash into your ankles with the ferocity of an elephant, and roll onto her back hinting that she wants her belly rubbed. She is still a pup, and has a lot to learn about life; she saw a bicycle for the first time a few weeks ago, and didn’t know what to think of the strange thing. Training has been a challenge; she has broken three leashes and one harness, but she will always come running and sit right down for a cookie. We look forward to having many joyful years with Rosie keeping us on our feet!"